Stay tuned for more events during Spring 2012 in San Diego. This website has been created for the purpose of learning more about the Mixtec, who are the third largest group of native Mexican peoples. They call themselves the Ñuu Savi, "People of the Rain." Their homeland is the Mixteca, a region which occupies the western half of the Mexican state of Oaxaca and small parts of Guerrero and Puelba, states on Oaxaca's nothern and western borders. The story of the Mixtecs is one of movement. They migrate from the Mixteca into other parts of the Mexican republic, as well as to the United States, seeking work primarily in the agricultural sector. California has been dubbed “Oaxacalifornia” because of the number of sizable, well-established communities of Mixtecs and other Oaxacan indigenous peoples living in the San Joaquin Valley (“home” to some 45,000-50,000 Mixtecs,) metropolitan Los Angeles, and northern San Diego County. They have a growing presence in Texas, Florida, New York and up the West coast up to Canada. The pace of Oaxacan migration is accelerating. While most migrants are men, women and entire families also migrate. Mixtecs live and work in our communities; there are Mixtec children in our classrooms. 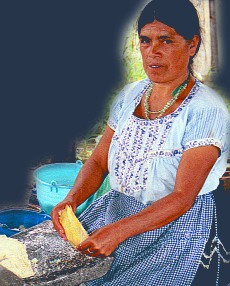 But far too often, Mixtecs are labeled simply “Mexican,” and assumed to be Spanish-speaking and mestizo in culture. This website was created to introduce many more people to the Mixtec’s unique, rich and proud cultural heritage.